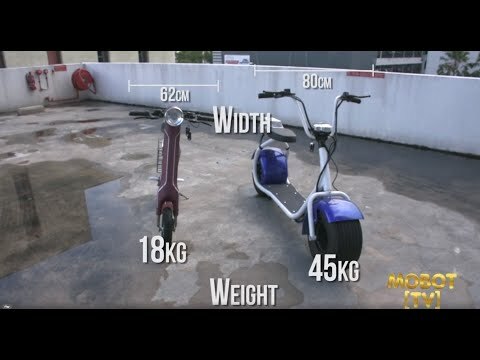 In this episode of Mobot TV, we give you a better idea of things to be aware of when choosing to buy an electric scooter online. We also re-enact an experience that someone had when they decided to purchase an electric scooter online and how finding out about MOBOT’s trade-in service was able to help in rectifying the mistake of having purchased an electric scooter that was not compliant with Singapore’s LTA regulations regarding electric scooters. The convenience of buying online has definitely allowed more and more people to be able to purchase just about anything they could want from the comfort of their own home. This doesn’t always translate to satisfaction though, as sometimes what we see online doesn’t always end up being exactly what we get in the mail. This becomes quite a dilemma when purchasing electric scooters online as that cool looking electric scooter might not actually be legal for use in Singapore. Online stores that sell electric scooters don’t have to abide by the rules set in Singapore, especially if they’re located in a different country, so being aware of these rules and regulations while making a purchase of an electric scooter can save anyone from a big headache and it also means that money spent turns into guaranteed satisfaction when the electric scooter comes in the mail and is legal for use in Singapore. If, however, that online cart has already been paid for and the electric scooter turns out to exceed the terms of legal use, it isn’t the end of the world because MOBOT offers a trade-in service that is open even for electric scooters that exceed the requirements set in Singapore. Check out the video to learn more and be sure to check back for more content regarding electric scooters and other personal mobility device information that we’re creating to give everyone a better idea of what type of electric scooter is the perfect electric scooter is for them.